They are idealists and staunch activists for the cause to "make America laugh again". The Deplorables are really making great progress of pushing for this cause as they've been hitting the road and doing the rounds of states and cities to uphold this worth cause. 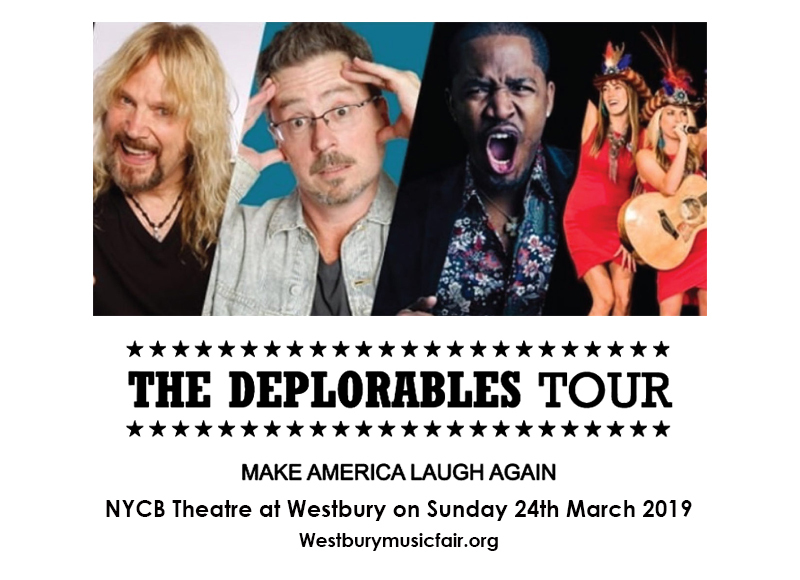 The Deplorables are taking stage at the NYCB Theatre at Westbury on Sunday 24th March 2019.Their biggest supporters are taking this rather seriously…. Oh well, it's a reason for friends to go on a night out and celebrate fun and laughter by chugging mega doses of comedy, music, as The Deplorables unleash their conservative mindset, transcending politics and unabashedly mocking liberals while celebrating the American Dream. Get your tickets now! The Deplorables describe their act as "an uproarious comedy show for conservative thinkers, Trump supporters, and good ol’ American Deplorables". Steve McGrew is The hell-bent southerner featured on Comedy Central and Sirius XM. McGrew calls his brand of comedy as "crossover" because his comedic style appeals to people from all walks of life, age groups, and ethnic backgrounds. He draws his punch lines from everyday life making him instantaneously likable, yet fires away with high energy, and one liner jabs to the funny bone. Michael Loftus can be seen in Comedy Central, HBO, Fox & Friends. Brian Haner appears on “Guitar Guy”, Comedy Central, Jeff Dunham Tour. This is the season and the reason to get a seriously good belly full of laughs. Gather your pals around for a raucous moment to cap the weekend. Get your tickets now!